In two separate incidents in early October 2013, the hopes of Africans attempting to reach Europe on crowded boats across the Mediterranean were destroyed when their dangerous vessels sank near the Italian island of Lamedusa. At least 339 died in the first incident, on 3 October, and thirty-four in the second, on 11 October. These tragedies are the latest in a long series, though the fact that the death-toll in the earlier incident is the highest ever in accentuated the shock. The political fallout has been intense, with Malta’s prime minister strongly critical of his European colleagues’ policy failures over the issue and the Italian government holding a national day of mourning. The reaction among Eritreans has also been profound, since a great majority of the victims on the first boat came from the tiny Horn of African country. In fact, the United Nations’s refugee agency UNHCR says that of the 30,100 migrants who reached Italy on boats from north Africa from 1 January-30 September 2013, the three biggest groups were from Syria (7,500 in total), Eritrea (7,500) and Somalia (3,000). The populations of these countries are respectively 22.4 million, 6 million and 10 million. The reason for the exodus of Syrians and Somalis is clear: devastating civil war and the destructive impacts of longer-term conflict. But what of Eritrea? If the view is extended from the vicinity of Lampedusa and Malta, the even greater scale of the problem can be seen. 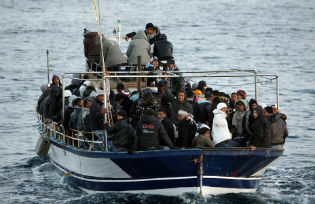 In fact, most Eritreans look for other routes of escape. There are roughly 40,000 Eritreans seeking refuge in Israel, 125,000 in Sudan and 86,000 in Ethiopia. In each case, their demographic profile – mostly young men – is the same. The consistent picture is of an unprecedented exodus of Eritrea’s youth. Eritrea is one of the poorest countries in the world, whose GDP per capita was $800 in 2012. In addition, reliable human-rights organisations report that Eritrea lacks press freedom or freedom of religious worship, has tens of thousands of political prisoners, is ruled by a ruthless dictator, and is embroiled in regional tensions across nearly all its borders. Somehow, though, a contrary view is promoted that forces baffled observers to ask: “is it really that bad?” This complacent narrative holds that Eritrea has achieved some Millennium Development Goals, is in a boom of some kind thanks to its mining industry, has a low crime rate, is free of military challenges from its neighbours, and has a secure government that faces little in the way of opposition. If the latter portrait is correct, however, it’s hard to understand why young Eritreans choose to flee their country in such unprecedented numbers, taking unimaginable risks at a time when conditions in the destination countries may also be uncomfortable. So what is wrong with these young Eritreans? Every Eritrean between the age of 18 and about 50 is meant to be doing national service, and those between 50 and about 65 are supposed to be in the “popular army”. In 2011, average life-expectancy in Eritrea was just over 61 years; that is, every adult in Eritrea is effectively under the command of the government, mobilised as soldiers, regimented as such, and deprived all sorts of freedom, including the freedom to make a decent living. The national-service recruits are trained and required to do any duty demanded of them, including hard labour in construction; their stipend amounts to about €25 a month. They all know that this is their fate, which only regime-change in Eritrea will alter. But any hope of regime-change, or even reform, was quashed long before those who are leaving the country today were old enough to understand the predicament that would dominate their lives. In September 2001, whilst the world’s attention was focused on 9/11, Eritrea’s president, Isaias Afwerki, and his close circle of generals and advisors arrested eleven reform-seeking ministers and officials. Anyone who sympathised with their call was over subsequent years made to disappear one way or another. Anything that represents a free society – again, free media and worship, business and enterprise, intellectual freedom – was systematically crushed in the post-2001 years, turning the country into a giant prison. The Eritrean youth, terrorised and demoralised, started to take their lives into their own hands in the only way they could. A trickle of desperate young people grew into the deluge of an entire generation scattering across the globe, setting new records in hopelessness but also of the despairing will to survive.